Could Basic Income really be implemented? There has been growing interest in the basic income. In 2013-4, a Citizen’s Initiative managed to achieve almost 300,000 signatures. In 2016, Switzerland will vote on whether to implement a basic income. Finland is considering a basic income experiment. Parties across the world take up the banner of basic income, as the idea seems to gain political currency. The idea of a universal basic income is that everyone should unconditionally receive a grant, regardless of their income or labour supply. Several adaptations exist, most notably what level is basic, however in its purest form, it should be enable people to “live without work”, as Robert Skidelsky says. In a recent article for Project Syndicate, Skidelsky calls for a basic income as a means to aid the ‘working poor’. Minimum wages and tax credits, Skidelsky argues, are insufficient, as they have left 38% of working families without a living wage. This result is not uniquely British – Portuguese researcher Alfredo Bruto da Costa also demonstrated workers to be a large share of the poor. In the spirit of fiscal consolidation, the UK government is seeking to partially replace tax credits with a higher minimum wage. Skidelsky warns that not only does this policy fail to protect the living standards of the poor, it shifts labour costs from government to businesses. In the face of worldwide automation, rising labour costs could well accelerate a process that could shed up to 50% of current jobs. For Skidelsky, basic income prepares us for a post-employment economy. Skidelsky not only opposes the fashion of policy reform to increase labour supply among net receivers, he supports the opposite – encouraging people not to work. This idea is not new – Gorz (1999), McKay (2001), Foster (2011) and others defended less employment, for different reasons, before him. 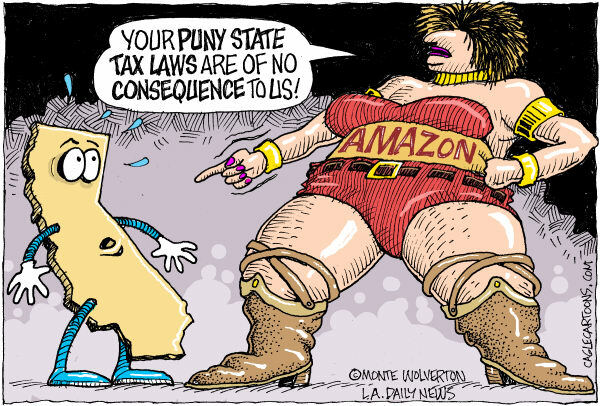 However, it is perhaps not yet ripe in a world where desert and contributive principles occupy a central place in understandings of tax justice. If political and equity problems could be put aside, could we afford basic income? Skidelsky’s “surely” is insufficient. Malcolm Torry has been struggling to find a strictly revenue neutral way to fund basic income without radical changes in income tax or the incomes of the poor. His working papers in EUROMOD, the latest of which in 2015, lay out fiscal plans for introducing a Basic Income in the UK. It is clear from these working papers just how monumental the cost of implementing Basic Income is. Torry, who is a Basic Income activist, allows for a small increase in income tax, but does not restrict rises in social security contributions. Therefore, his ‘feasible’ way to implement revenue neutral Basic Income includes a 12% rise in national insurance contributions, and that is for a Basic Income far below minimum income standards. In summary, while automation adds to a long list of reasons why discouraging employment might not be a bad idea, politically basic income is still unpopular and, more importantly as we are concerned, very hard to finance. Its time has not yet come. Self-financing cuts for labor or capital taxation? Conservative economists and neoliberal politicians have often discussed the opportunity to increase the taxation revenue by decreasing the tax rates on labor or capital income. The theoretical basis for this assumption is offered by the so called Laffer curve, which describes the relationship between tax revenues and tax rates as a simple single-peak parable. The economist Arthur Laffer, who was also an advisor of U.S. President Ronald Reagan, developed this theory and fostered its execution during Reagan`s term in office to overcome the 1981’s recession. But the true shape of Laffer’s curve is hard to estimate. 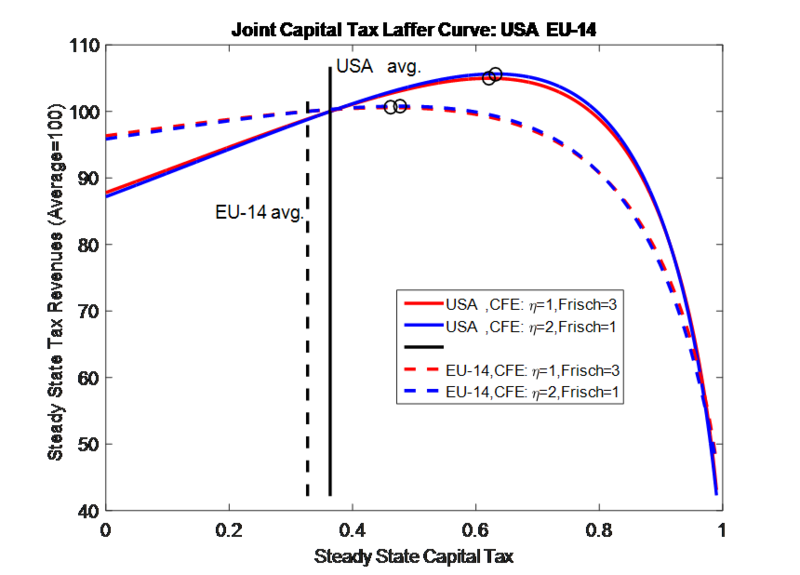 In 2011 Matthias Trabandt and Harald Uhlig published a paper about a calibration of different Laffer curves for the U.S. and 14 EU-member states to specify “how far we are from the slippery slope”. Their model was based on the neoclassical growth approach. 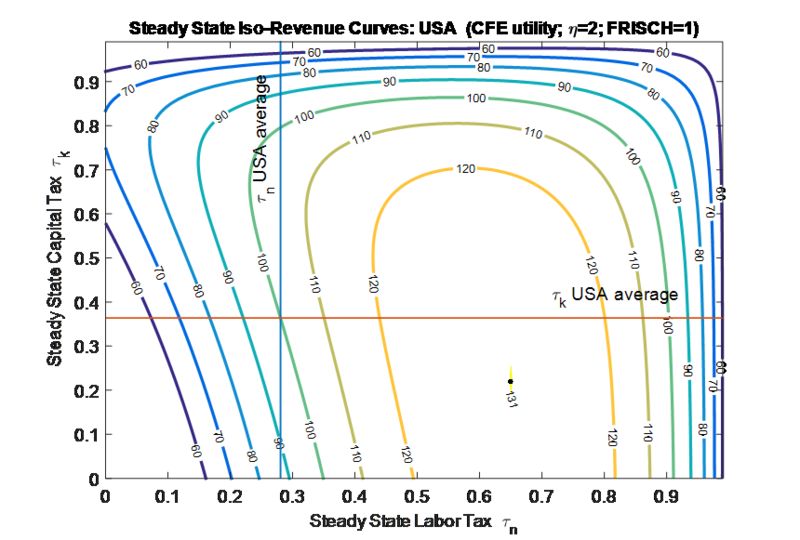 They computed the curves for labor and capital income and also calibrated the model with different assumption about the elasticities of substitutions. As you can see in Figure 1 the result for the U.S. labor income taxes was pretty clear. In the American taxation system there was no free lunch for tax revenues possible. But keep in mind there are still distortional effect caused by the current tax rates, which create a fall in output and in result a welfare loss for the economy as a whole. The Laffer curve only shows us, that the government’s budget will decrease, if tax rates are reduced. Furthermore Trabandt and Uhlig pointed out that there is a significant difference between the case in which additional tax revenues are used for lump-sum transfers in comparison to the case of public spending. 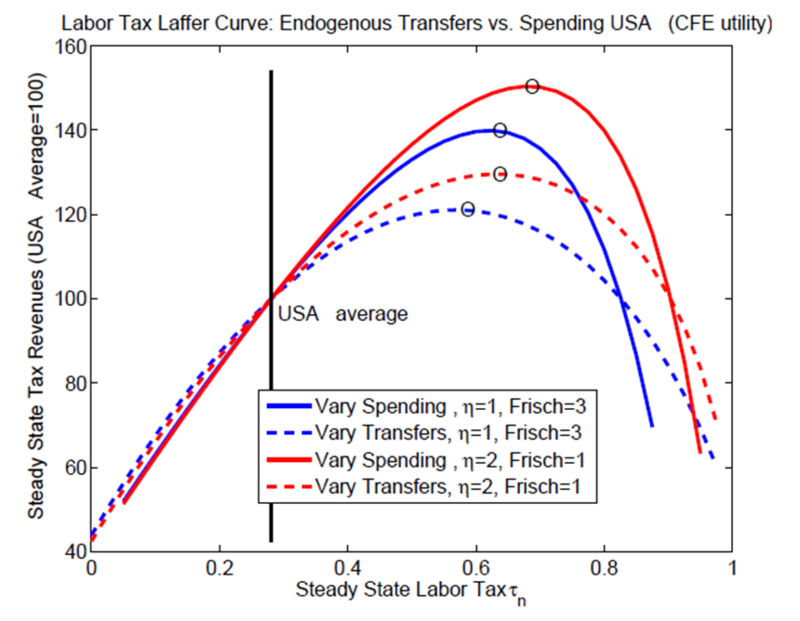 If the government uses tax raises for additional transfers and redistribution, the distortional effects on the economy will be obviously higher. We can gain another insight, if we compare this figure with the calibrated Laffer curves for capital income in Figure 2. It is quiet established that taxation of capital is relatively difficult for certain reasons. The Laffer capital income curve seems to confirm this fact, since it is much flatter than the previous one. An increase of the capital income tax rate would generate significantly less revenue than labor income taxation. Therefore a government, which wishes to increase its revenues – may it be for redistribution or debt repayment – should decrease the tax burden on capital income and raise labor income or consumption taxes. (latter ones have no Laffer peak) This recommendation is also in line with Trabandt and Uhlig’s illustration of Iso-Revenue Curves for the USA. At the so called Laffer Hill the government maximizes its tax revenues on labor and capital income. As Figure 3 shows, the U.S. could increase their public budget by 31% in total, if they would follow this advice. At first sight the government’s decision appears irrational, but probably the choice of the current capital income tax rates is caused politically by redistribution objectives. Notice that in this case there is no free lunch available for the U.S., because they have to increase labor income taxes simultanously to compensate the capital tax reduction. So in conclusion every government has to balance between optimizing tax revenues and redistribution between receivers of capital and labor incomes. Trabandt, M., & Uhlig, H. (Mai 2011). The Laffer curve revisited. Journal of Monetary Economics , 58 (4), S. 305-327. In June 2011 the Work Programme was launched in Great Britain. The main target with the new programme was to deal with the high number of people that are on welfare, or in risk of staying long-term unemployed. The Work Programme is outsourced from the government and provided by several organisations, in public, private and voluntary sector. In this post I look at the programme, the content and some of the critics against it. The Work Programme is designed to include a broad diversity of individuals to enter the workforce. Some of the former welfare-to-work programmes in Great Britain have only included smaller, specific groups. This programme has a focus on helping more people, indifferent to the reason for why they are on welfare. Nevertheless, there are some circumstances that divide the potential new workforce. Some individuals are required to join the programme, while others are not. Individuals over 18 years are required to attend after 9-12 months on Jobseeker Allowance. Furthermore, some people that are seriously disadvantaged in the labour market are required to join after 3 months. Individuals on Employment and Support Allowance, income support and incapacity benefit are partly required to join when they are considered “fit for work”. The significant diversity of individuals implies that some people will need more assistance to get back to work then others. Thus, the providers will receive a higher payment from the government if the individual require more assistance to get into sustained work. 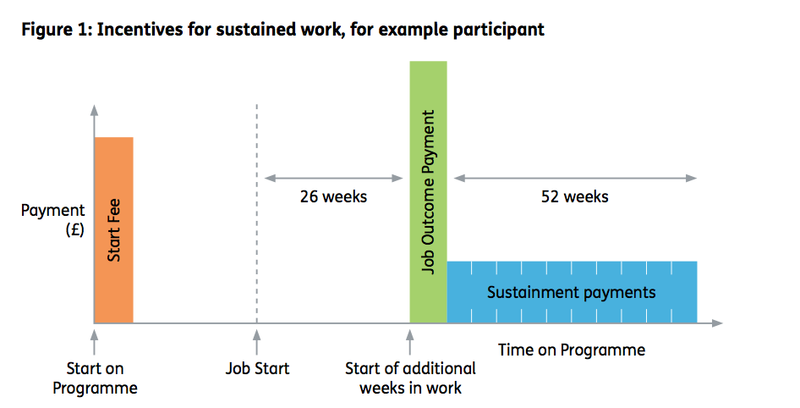 The programme works like this: Providers will receive a start fee when participants starts the programme, in addition they will receive a payment if the outcomes after 26 weeks in work is met, and more each forth week if they continue working. See figure 1. The Work Programme in Great Britain has now been in running for four years, and the effects? Well, due to the to statistics the programme seems to have an effect in helping people getting into work. On average, programme has resulted in people tending to stay longer in work now compared to earlier. On the other hand, the diversity in the group is still an issue. 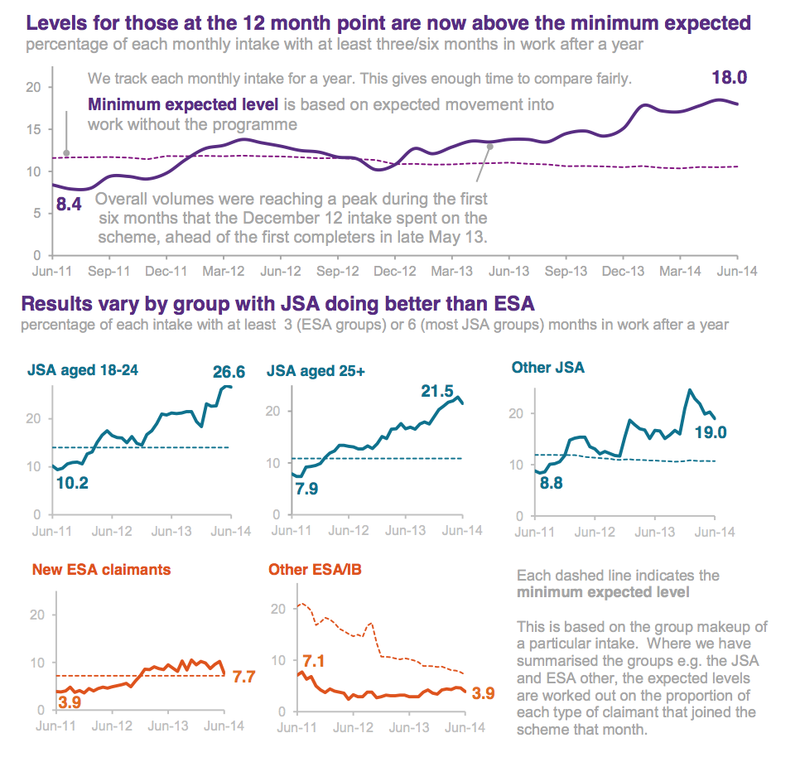 In figure 2, we can see that the effect from the programme has not succeeded in helping the disabled and seriously ill jobseekers(other ESA/IB). Just 9 % of people with mental health problems and only 4 % of the ones on incapacity benefit have found a job after they joined the programme. So, the outcome for the ones who probably need this help the most, is not necessarily met. Moreover, the Work Programme has also been criticized for the way it allows contractors to receive a yield on a societal problem. Due to the fact that the providers will get more money if they achieve to keep an individual in work, it could be advantageous for the organizations to give more help “easier” part of the population. This again may cause that the individuals more likely to succeed, are prioritized. From my point of view, I believe that Great Britain is heading in the right direction in trying to solve a societal problem. In some groups, the programme has decreased unemployment, but there is still a long way to go. The government might need to open their eyes for the part of the programme that is not effective. Unfortunately, the reported programme results tend to focus on the positive outcomes rather than discussing what is really needed in the society. The debate regarding equity of tax policy becomes increasingly important in a world were inequality is growing. In United States, for instance, the richest 1 % received 18 % of pre-tax income in 2008, rising from 8 % in 1980 (OECD 2012). The debate is often associated with the degree of progressivity in a country’s tax structure. A valuable input in the debate may be a measure of tax progressivity that can reveal the differences in progressivity across competing tax schemes. The Stroup index (or tax progressivity index) measures the effective progressivity of tax policy and reflects changes in tax rate structure, income brackets of tax policy, and income distribution in the society (Stroup 2004). Stroup (2004) stresses that if we use the average tax progressivity as a basis for discussing the equity of tax schemes, measures of tax progressivity should relate income tax shares borne by a given income percentile in a society to the income share distribution earned across all income levels in society. Then a change in average tax rate progressivity can occur without a change in the actual marginal tax rate structure. Thus the construction of the Stroup index implies that it reflects changes in tax progressivity even when tax policy remains unchanged (Stroup 2004, p.207). The figure below illustrates how the index measures the degree of progressivity in US from 1980 to 2000 (Stroup 2004, p.211). During these two decades four major federal income tax policy changes influenced the structure of the marginal tax rate and/or the income tax brackets. For instance, the 1986 Tax Reform Act (TRA’86), or Reagan era tax cuts, which decreased the total number of tax brackets and the marginal income tax rates for each brackets (especially for households with highest income). Previous reports claim that rising tax shares after the tax reform were borne by the highest income earners. 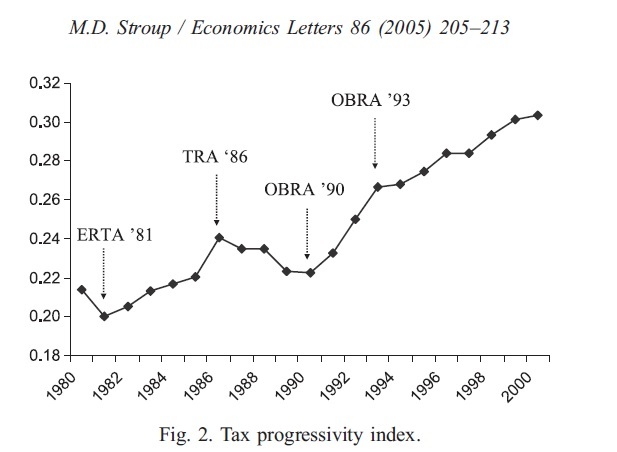 However, by estimating the tax progressivity index Stroup finds that the tax progressivity is actually decreasing. Stroup discovers that the increase in tax share for the richest 1 % was smaller than the increase in adjusted gross income earned (AGI) share in the years after 1986. Hence, Stroup concludes that this group’s income share increase was five times higher than their tax share growth, creating a lower average tax rate and a lower tax progressivity index (Stroup 2004, p. 211). The example above demonstrates the importance of relating tax share to income share across all income levels in order to have a correct picture of changes in the progressivity of a tax system and inequality regarding the income tax burden. It also illustrates another useful characteristic of the index, that is can be used to decompose an observed increase in total tax revenues into the portions attributable to either an increase in total income or increase in income inequality (Stroup 2004, p.207). To reveal the differences in progressivity across competing tax schemes, a reliable and accurate measure of tax progressivity is useful, especially if the goal is to have a normative analysis of tax progressivity. Furthermore, the fact that it reflects the issue of inequality makes it even more relevant in today’s growing economic differences among households and individuals. M.D. Stroup 2004. An index for measuring tax progressivity. Economics Letters 86 (2005), 205–213. Hoeller, P. et al. (2012). Less Income Inequality and More Growth – Are They Compatible? Part 1. Mapping Income Inequality Across the OECD. OECD Economics Department Working Papers, No. 924, OECD Publishing. M.D. Stroup & K. Hubbard (2013). An Improved index and estimation method for assessing tax progressivity. Working Paper No.13-14 August 2013. Mercatus Center: George Mason University. April 1989. Margaret Thatcher, the Iron Lady, has been Prime Minister of the United Kingdom for 10 years. Her latest, and arguably boldest policy – to replace former property taxation schemes in the UK with a new lump-sum tax – the Community Charge. Taxes differ depending on how average taxation varies with income: regressive if it decreases when income increases, proportional if it does not change and progressive if it increases with income. 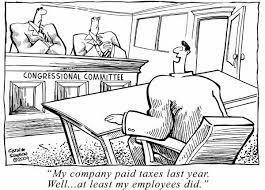 Regressive taxes are generally regarded as quite unfair – any real debate happens between proportionality and progressivity. While the first may be the most equalitarian, arguments for progressive taxes stem from fairness, as the wealthier can generally part with a larger share of their income with a smaller utility loss than the poorer segments of society. While generally the most conservative opinions are for proportionality, since they are the most neutral of the three, the Thatcher administration took market neutrality to its extreme by attempting to replace the existing property-based (progressive) taxes with lump-sum taxes – meaning every adult, no matter their income (with some exceptions), should pay the same tax, as determined by their municipality. The aim was to make the local public provision of goods into a more market-like scheme: each local government would decide how much they wanted to provide, and tax citizens accordingly. People who preferred a higher level would stop free-riding (consuming more than they paid for) and possibly even move to communities where it was higher. On the other hand, those who valued local provision lowly would move to communities with lower taxes and as such stop overpaying. In practice, however, I would assume most people would not change their residence only due to their preferences for local public provision. Obviously, this market approximation was not perfect. Another argument for this kind of taxation was the effect on public decision-making. Since an increased provision would naturally mean higher taxes, which voters are not fond of, administrators would seek to provide the most possible at the lowest possible cost – an effective measure against the adverse selection problem that perpetually hounds public administration. The result, however, was catastrophic – enormous riots broke out and there were mass campaigns for tax rejection (basically, non-payment). With the Community Charge, Thatcher saw her popularity plummet, and her continued defence of it was likely the final nail in her political coffin. Faced with the resignation of her cabinet and challenge of her party, she had no choice but to resign herself in 1990. While the idea might sound good on paper, and lump-sum taxes are generally regarded as non-distortionary, in practice its implementation in the UK meant that low-income tax payers saw a much higher share of their income taken, as part of the tax-burden shifted from high to low-class citizens. The British people killed the tax, in a clear statement of their fairness standards – the perceived increased efficiency was clearly not enough to offset the unfairness brought about. One might argue that great part of the benefits created would be long-term and were as such not observed. This, however, is well likely to remain unproven, as in the wake of such a disastrous example, it is expectable that no politician will risk the same fate. Belgium is the highest congested country of Europe according to the annual Inrix Europe Scorecard, a world leader in real-time traffic information.. Last year, we lost an average of 51 hours stuck in traffic, compared with 58 hours in 2013. The country leads this ranking before their neighbouring countries like Germany and the Netherlands. The cost of traffic jams is so high that even the companies would like to see some sort of taxation to get a more efficient traffic flow. Febiac (La fédération Belge de l’Industrie de l’Automobile et du Cycle) is also an advocate of traffic taxation. “Road pricing or zone taxation , will surely be one of the main subjects in the next regional elections” predicts Brussels State Secretary Bruno De Lille ( Green Party) . His cabinet is studying whether road pricing or a zone charge is the best solution. The OECD is in favour of an electronic system of road pricing to combat congestion. Belgium has “one of the worst congestion states observed in the OECD area “, says the organization in its latest economic report on Belgium. There consist different opinions of political parties around the nature of the tax. The best known is the congestion charge as in London, but that is the least popular. Which consists in a daily amount (£11.50) levied on vehicles entering a zone between 07:00 and 18:00, Monday to Friday. A variant of this taxation are the road pricing schemes, which will only have to be paid by commuters, which is applied in Stockholm. All of these systems use cameras to read license plates. On the other electronic method of road pricing, there is a much broader consensus. There is a device in the car, the OBU ( on-board unit ) , which is equipped with GPS and allows the government to charge a variable fee depending on the time , day and road used . In my opinion, the on-board unit is the most honest way to charge road users. By using this system, companies that manage their own car fleet for employees could adjust the employee’s work schedule to get a cheaper tax arrangement with the government. That’s why I prefer a more variable tax instead of a fixed fee, it leaves the car driver more freedom. The chauffeur can choose for public transport if the variable tax is high at that specific moment or he / she could just use the car on a less congested moment. To conclude, there is still a lot of research to do to make a good and cost-efficient decision. A lot of debates between different political parties will follow, but they all agree on one point of view. The Belgian government needs to take measures in order to ensure the Belgian companies that their employees are on time for their work as the neighbouring countries face fewer difficulties. This blogpost was written by Laurens Maximus (2327), Exchange student at Nova SBE. Walking through downtown Lisbon one of the most notable characteristics, in addition to the historic charm and culture, is the stock of neglected and dilapidated buildings. These buildings are unsightly, susceptible to fires and have potential use for illicit activities and squatters. The majority of these buildings are located in the historic central area of the city. Although using these buildings as canvases for urban art has led to the praise of Lisbon as an artistic hub, in general proximity to neglected and unsightly buildings have a negative connotation. Policies to address the climbing stock of neglected housing include rehabilitation and maintenance tax credits to stimulate the upkeep of building quality. Portugal’s restrictive and historic rent control laws, which have in general been criticized, favour the tenant and lead to situations of frozen rental income for landlords without enough to maintain their properties. Without legal means to raise the rent, landlords have no incentive to invest in the quality of their assets, and buildings are left to become neglected and abandoned. 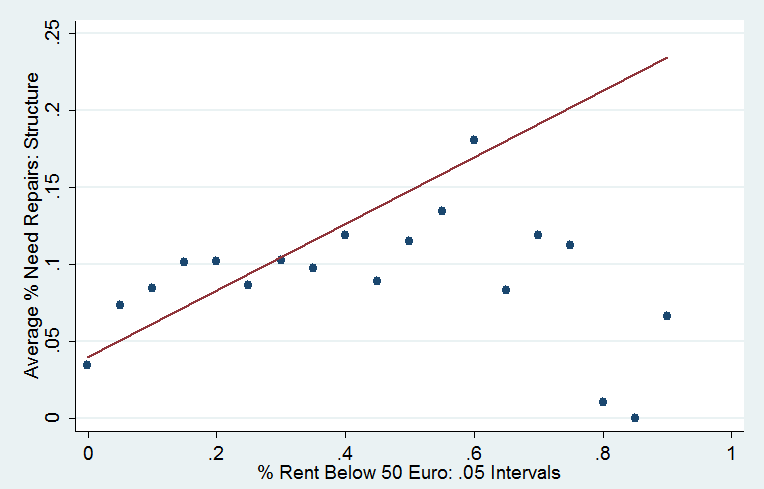 There is a strong positive correlation between the percentage of residents in a city block paying under €50 a month (a measure capturing rent control) and the decreasing quality of building stock for Portugal’s two largest urban areas (Lisbon and Porto) in 2011. New reforms are being implemented and strict rental laws are beginning to relax with the introduction of austerity measures. Causational arguments between rent control and building quality aside, these abandoned buildings are now – as we move from times of crisis and in a more flexible market, a prime item for investors. With current owners unable to pay for repairs and maintenance, locals and international firms are making use of tax credits and incentives which are being provided by local authorities to incentivise the redevelopment of the aging building stock. Such neglected properties are being converted to hotels, cafes or restaurants to start earning rent. Additional housing dynamics exist for the renovation of abandoned buildings which are clustered in the historic downtown core and located in historically protected zones of the city, which have unique maintenance and rehabilitation requirements to maintain the historic ambiance of the area. Two mechanisms may influence properties located in protected zones, either a direct heritage effect where investors gain benefits from owning heritage properties or alternatively where the strict regulations and administrative burdens have a negative impact on dwellings in these zones. It is estimated that being located in a protected zone of Lisbon actually has a negative impact, decreasing housing prices in the order of 4%. Current tax incentive policies are not heterogeneous however when considering the impact of neglected buildings located inside and outside of historically protected zone, and thus if there are negative housing effects due to strict renovation mandates in protected areas then a different tax incentive scheme may be required to incentivise the rehabilitation of dilapidated housing stock in historic areas. The underlying fundamental however is to provide the owners of buildings with the right incentives to invest in keeping the building quality at some minimal level or in line with official heritage designations. “Carrot policies”: more efficient to fight against tax evasion? Since the financial crisis of 2008, governments have been trying to improve their budget management in order to pay off sovereign debt. That means looking for new budget sources as well as avoiding waste. That is why this post will deal with an article from The Financial Times entitled “Europe’s shadow economy costs €454bn in “lost” taxes”. This article emphasizes to what extend shadow economy is a burden for public finance. Indeed, although the amount of tax evasion is hard to measure, estimations of losses for governments are really high and fighting them on an efficient way is difficult. Under reporting by businesses and undeclared work are responsible for 33% of losses and according to the IMF this is caused by corruption and excessive regulation. This article suggests that politicians should adopt incentive policies instead of repression ones. It leads us to wonder: to what extend are incentive policies efficient to avoid tax evasion? Let’s try to answer the question and analyse qualities and limits of these policies. 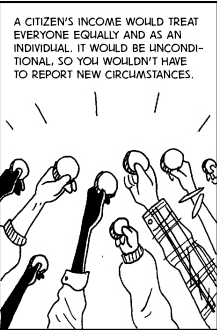 In light of the results of traditional repressive policies, incentive ones seems more promising. Indeed, according to the EU, 168 billion euros of VAT have been lacking in September. Nevertheless, Friedrich Schneider’s estimations are much higher: 454 billions euros that represents 8.6% of government revenues. That is the evidence that governments have to try other policies. That is what Belgium government does by using tax rebates and subsidies to transfer activities to formal economy. Thanks to this system, everybody can afford a voucher that corresponds to one hour of domestic help and costs 6.70 euros. This voucher is tax-deductible and the net price is only 4.69 euros while participant companies also receive a subsidize of 14.30 euros per voucher. This system makes people preferring formal economy than shadow’s one, this was the case for 10% of voucher consumers. The tax receipts lottery is another type of incentive policy. This was implemented in several countries, Portugal and Slovakia are part of them. Citizens are encouraged to ask for receipts by organising a lottery in which the receipts selected at random makes them win big prizes like cars. In Slovakia, this special lottery is very popular and 3 million receipts are submitted every two weeks. This has made the government earn 8 million euros per year. However, these policies present limits. Indeed, Belgium vouchers have not a significant impact on shadow economy while this policy is very costly. In 2005, this has enabled government to save 93.1 million euros when it has cost 303.3 million euros. Regarding tax receipt lottery, results are not much better. Most part of receipts is from the retail sector where shadow economy isn’t as import as the service industry. However, the later only represents 2% of submitted receipts. Tax receipt lottery also has perverse effects and negative impacts: “professional players” submit receipts from purchases they have not done, Portuguese citizens feel that it hurts their dignity and car prizes are not fitting with ecological policies. In my opinion, these policies are not efficient enough while computing results-costs ratio, and they have to be completed by other measures like urging citizens to use credit card instead of cash. Computerising the tax system seems to be a good solution to improve control because it enables to cross data and identify dodgers. That has been implemented in France. Jeb Bush’s tax plan: A viable high-growth strategy? Jeb Bush, former governor of Florida and 2016 US Republican presidential contender, released his tax plan on September 9th. He believes that his tax reform is a high-growth strategy. Could this tax plan contribute to achieve the objective of 4% annual economic growth, as Jeb Bush stated, without widening the deficit? Regarding corporate income tax, Jeb Bush offers to reduce its rate from 35% to 20%, to stop taxing repatriated foreign earnings and to make earnings currently hold abroad by US companies subject to a one-time tax of 8.75%, payable over ten years. US corporate income tax rate is currently the highest in the OECD. Such a high corporate tax rate may be a burden on firms’ productivity. Besides, the United States is one of the few countries where repatriated foreign earnings are taxed. For these reasons, many US multinational companies flee US tax system by hoarding cash overseas: in 2014, US companies’ estimated foreign cash holdings was approximately $2 trillion. Some US companies change their nationality to benefit from lower corporate income rates abroad. This process, known as “tax inversion”, can be implemented by acquiring a foreign company. Since 2012, about 17 US companies have reincorporated in low-tax countries. Jeb Bush’s measures may encourage multinational companies to pay taxes within the US and prevent them from implementing tax inversion. They would also boost firms’ productivity, foster job creation, higher wages and investment. As for the individual income tax, Jeb Bush plans to double the Earned Income Tax Credit (EITC) for childless low-earners, which would be a significant relief for low income earners and would foster labor force participation. Moreover, Jeb Bush wants to consolidate the current seven tax brackets, ranging from 10% to 39.6%, into three with rates of 10%, 15% and 28%. The plan also includes doubling the standard deduction, eliminating state and local income deduction, and capping itemized tax deductions, such as mortgage interest and medical deductions, at 2% of the adjusted gross income. Millions of American would get rid of tax liability and all taxpayers would get a higher after-tax income. However, upper class seems to benefit the most from this tax system: the wealthiest 1% would enjoy an income boost of at least 11.6% and would be less affected by the ceiling on itemized deductions. Consequently, Jeb Bush’s tax plan would have positive impacts on economic growth: the think-tank Tax Foundation estimated it would lead to a 10% GDP growth over the long run, to 7.4% higher wages and to increased labor force participation. Moreover, all taxpayers would benefit from it. Nonetheless, it could considerably widen the deficit and reduce federal revenue by between $1.6 and $3.6 trillion over the next ten years. Estimating plan’s effects is difficult, since companies and individuals would change their behavior, but it may be sustainable on a dynamic basis, even though some measures are very generous to wealthy people and do not contribute much to boost economic growth. Base Erosion and Profit Shifting: Light at the End of the Tunnel? On Monday (5th Oct.), the OECD are releasing the outputs of their joint project with the G20 on Base Erosion and Profit Shifting (BEPS). This is a phenomenon with a lot of history. Already in 1961, J.F. Kennedy spoke of “artificial arrangements between parent and subsidiary (…) in order to reduce sharply or eliminate completely their tax liabilities both at home and abroad.” Yet, they are all the more relevant today as repeated scandals emerge of near-zero tax bills for immensely profitable household names, such as Google, Starbucks and Amazon. Beyond the difficulties it raises for public financing, and the equity concerns of firms not paying their fair share of organizing society, BEPS means unfair competition, as multinational firms pay 5% tax while smaller businesses pay up to 30%. This raises a (further) barrier to entry and generates inefficiencies. For this reason, governments should combat BEPS, if not to optimize taxation, then in their role as ‘hosts of efficient markets’. The reality of BEPS is startling. Barbados, Bermuda and the British Virgin Islands – three small Caribbean islands – received in 2010 more foreign direct investment (5.11% of global FDI) than Germany (4.77%) or Japan (3.76%). Not only that, but they made more foreign investments (4.54%) than Germany (4.28%) – home to several of the world’s largest firms. Luxembourg and the Netherlands also manage huge inward and outward stock investments, at over $2 trillion in-and-out and $3 and $4 trillion in-and-out respectively. Of these, 83% are made by special purpose entities which are “entities with no or few employees, little or no physical presence in the host economy and whose assets and liabilities represent investments in or from other countries and whose core business consists of group financing or holding activities.” These examples are, in and of themselves, huge and only give us a glimpse to the bigger picture. With 60% of world trade taking place within (not between) multinational enterprises, the problem is likely to be of far greater magnitude. It is clear that the most effective solution to this problem is international. This is why the G20’s participation in this project is so significant. Nevertheless, observers should be cautious in their optimism. Tax havens are not in the G20. Mostly, they are small economies, inflated by these capital inflows, and otherwise incapable of attracting investors. To persuade them to abandon their competitive advantage in tax will require more than grand pronouncements and soft power. Furthermore, given ample criticism of the OECD’s programme by tax justice experts, (for detail, go here) even in the unlikely event of an international agreement, policy entrepreneurs should be prepared to find creative solutions to base erosion and profit shifting. While policy solutions are far from easy (you only need take a look at the OECD’s first batch of proposals), tweaks and patches are destined to die in the bureaucratic cesspits of oblivion, inefficacy or fatal disagreement on the details. In any case, solutions are essential to fix not only fiscal crisis (through additional revenue), but (by making taxes progressive again) the crises of economic inequality and (by tax justice) post-democracy. In OECD’s publication Education at a Glance 2014 it was once again found that Denmark was the OECD country that spent the largest share of its wealth on education with a total expenditure on institutions of 7.9 pct. of its GDP in 2011. The following graph breaks down the public costs and compare it to the public benefits for a woman and man respectively attaining tertiary education in comparison to the OECD average. The first thing that sticks out is how the Danish public sector actually looses money on a woman attaining tertiary education – it has a net cost of nearly 65.700 equivalent USD when you look at NPV. Men’s attainment on the other hand gives a little surplus of 28.500. For both cases it is less beneficial for the public sector having either men or women attain tertiary education relative to the OECD average. Can this be a sign of inefficient use of public funds in Denmark? And if so, is it a problem? From a theoretical point of view a high degree of public spending could actually lead to a population educated above the efficient allocation. The economic intuition being that when individuals make the decision of how much education to take on they (in theory) weigh the benefits over the cost and when the education is funded by the taxes their direct cost of attaining additional education has decreased. Their private optimization problem causes thereby a higher than social optimal level of education because they do not take into account the public spending on the area. The above could be a possible explanation for the overall relative small benefit – making 40 pct. of the young population (aged 25-34) that had a tertiary education in 2012 being too many. 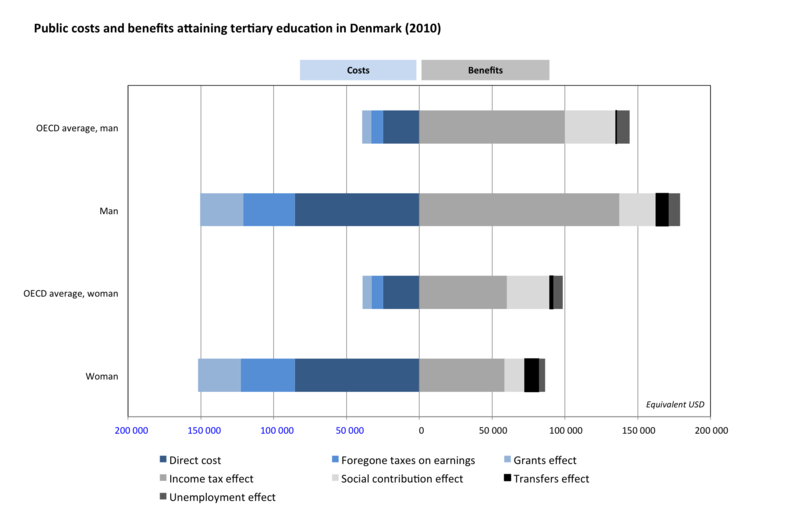 The public cost-benefit analysis from OECD though only takes into account the purely economic dimensions of attaining education and not that it also entails side effects that can benefit society. Different studies have shown that education among other correlates negative with crime, can increase economic growth, strengthen health and in general that it boosts civic activities. As with a lot of social science studies the causality is not 100 pct. established since it is hard to get rid of endogeneity problems, but the correlation is there and it seems reasonable to me to assume that it is not spurious. Finally Denmark’s large public spending on the educational system shall also be seen in perspective of its in general big public sector. Like in all other parts of the Danish welfare state the objective is to ensure that everyone no matter their social background can seek to attain education to the level at which their abilities can get them. If that makes a couple of people take an education where it might not have been beneficial for them if it was not at (almost) zero cost, then I think it is worth it as long as the economy can bear it, especially in the light of the externalities not taken into account. Tax evasion and shadow economy: Chronical problems or “economic illnesses” with possible remedies? It is widely known that tax evasion is pervasive in most economies, imposing great revenue budget losses for the governments. But how serious are the side effects of the shadow economy? According to Murphy, in Europe, tax evasion represents more than €1 in every €5. Particularly, in Portugal the scenario is severe: in 2011 the size of the shadow economy amounted to 23% of GDP, an astonishingly large value when compared with the 10,6% of GDP that the government spends on health care. This implies that the taxes lost as a result of the parallel economy would be enough to cover 82% of the healthcare spending. Clearly, this is too big to ignore and highlights the need for effective action. The Portuguese government is addressing this problem closely, having designed a strategic plan for the period 2015-2017 to fight fraud and tax evasion and having already launched policies that create incentives for tax compliance. Namely, the well-known rule that allows tax payers to deduct 15% (the initial proposal was of 5%), and up to €250, of VAT in restaurants, hairdressers, hotels and car repairing, aims at decreasing tax evasion in some sectors that are more prone to avoid their fiscal obligations. An interesting point is, therefore, to know if these kind of incentives have the capacity to increase the tax base and, if so, what are the downsides of such policies. The typical way to analyse tax payers’ decision of whether to evade taxes or not takes into consideration the probability of getting caught and punished, the size of the fine for evasion as well as the agents’ degree of risk aversion. While this “deterrence model”, originally put forward by Allingham and Sandmo (1972) ignores behavioural factors affecting individuals’ decisions, later research has addressed them. In this line, there is evidence that if citizens have confidence that the government will defend their interests then taxpayers will tend to be more cooperative, in the sense that they will pay taxes even when their optimal choice would be to free ride on other taxpayers’ contributions. For Portugal, this may actually have a negative impact on the tax base, since Portugal ranks poorly in the corruption perception index: in 2014, it was only the 31st country more transparent, in a total of 175 countries. Concerning policies that reward taxpayers, it is usually accepted that they increase tax compliance. Indeed, when incentives are given to “good” taxpayers, the relative price of paying taxes decreases. So, according to this argument, government’s decision to allow deductions of 15% of VAT will tend to decrease the tax gap. Nevertheless, such policy raises some equity concerns. Indeed, it can be argued that this incentive scheme is regressive since it benefits mainly high income people: to obtain the maximum deduction of €250, taxpayers would have to spend €9000 annually in the referred services, which is a value difficult to reach even for middle income families. It seems, therefore, that this reward policy is actually able to increase the tax base but, certainly, the greatest gains to the fiscal system would arise from a decrease in corruption and a more transparent political process. In the 1600th century the Danish king (Frederik the 2nd) had a problem of taxation. In order to get a higher income for the state, he wanted to tax the ships sailing through the Danish waters in order to get to the Baltic ocean. In collaboration with some advisors they decided that when a ship entered Danish waters they should tell how much the shipment was worth and the tax was deduced from this, however the king had the option of buying the shipment for said price. So what would happen if this kind of tax were transferred into the modern economy? The principle is of course not applicable to all taxes but it could be used for determining the taxes on housing. The owner of the house comes up with a price for the house and the state either tax this price or buy the house for said price. From a purely economic point of view this would be a great experiment since it would be possible to value an intrinsic value – namely the attachment the consumer has to the house. Economists have always been blamed for the fact that they only measure utility in terms of money (not exactly correct), so this experiment could in theory be ground breaking since we would be able to put a value on an emotion. However is a tax like that even feasible in the modern economy? That answer is most likely no. But if we suppose that this tax was actually introduced a lot of interesting things would happen. For a country like Denmark with one of the largest public sectors in the world1 (compared to the number of citizens) it would most likely shrink the public sector since the need for labor wouldn’t be as high, when the consumers have an incentive to provide the correct price plus the price of the attachment they feel towards the house. taxation principle proposed here also counter. The mere threat of the state buying your house would be enough for the consumers to set the price they can afford for the house and this way the State actually never has to go and buy houses. The tax proposed in this blog is obviously not possible in the modern society, the mere thought of the State forcing people to leave their houses is absurd, however the thought experiment with this tax is very interesting for economists (as long as it stays between economists). Frederik Falholt (Student number: 2355). In 2011, the sixth Belgian state reform was the culmination of the 541 days crisis without a government in Belgium. The goal of this reform is to produce “a more efficient federal state and a larger autonomy for the federated entities” and started to become effective on the 1st of July 2014. The list of the competences transferred to the entities is long and diversified; it affects for example economics, health, environmental or employment competences. This new reform, also called the Butterfly Agreement, also includes more fiscal autonomy for the 3 regions of Belgium. To give more fiscal autonomy to the regions, the Special Finance Act had to be revised. The Special Finance Act had its origin back in 1989 following the third state reform and established that the regions and communities were to be financed mainly through allocated parts, or dotations, by the federal personal income tax, corporate tax and the value-added tax. The newly revised Special Finance Act came into effect on the 1st of January 2015 and includes a 20€ billion budget transfer from the federal state to the regions. The regions can allocate this budget for whatever new competences they want. “The expansion of regional fiscal autonomy in the sixth state reform is accomplished through the power to impose unlimited “extensive surcharges” (a certain percentage on top of the standard tax) regarding the personal income tax. This autonomy replaces the previous dotation from the personal income taxes. Furthermore, the regions can impose tax increases or decreases, as well as reductions on the federal personal income tax concerning matters for which they are competent (e.g. the renowned “living bonus” to acquire or keep your own property). The sum of the surcharges, reductions, tax increases and decreases is called the “regional personal income tax”. Nevertheless, the powers transferred in the sixth state reform to the regions are financed with new dotations instead of increased fiscal autonomy”. Now, that the regions can levy their own taxes, it means that they will be able to increase their accountability and have a greater incentive to perform economically. However, this transfer will probably have a negative impact on foreign executives who benefit from the Belgian expatriate tax regime. To make the transfers really effective, the regions have to work extra so that all the changes can be made in a smooth way and ensure that it does not increase the administrative burden for citizens and companies. Regions will have to levy many more taxes than before and they need experts to do so but there is currently a lack of resources. The Belgian Tax Authorities also have extra work since, for the first time this year, they had to modify their software according to the new regional taxes already in place following the sixth state reform. It is the task of the future governments, federal as well as regional, to make sure that this new reform, and probably not the last, will indeed promote efficiency as it was announced by the previous government that committed to this reform. This post focus on the interesting findings of Ester Duflo, described in the published paper “Grandmothers and Granddaughters: Old-Age Pensions and Intrahousehold Allocation in South Africa”. In the beginning of the 1990s South Africa, the benefits and coverage of the national social pension programme were expanded to include the black population, reflecting the end of the apartheid era. This event created an interesting subject to explore how cash transfers redistributed to adults accrues to children’s health and physical development. It is widely recognized that low levels of investments in child health have consequences for the economic growth, distribution and welfare in the society. The literature has suggested that benefit transfers to women are associated with greater improvements in child health since larger shares of the household income is spent on nutrients and health as compared to transfers falling in the hands of male beneficiaries. As one of relatively few effective cash transfer programs in developing countries, the South African old age pension program serves as a natural experiment of its impact on children’s nutritional status conditional on the recipient’s gender. In rural areas, the benefits amounted to about twice the median per capita income by 1993 and more than a quarter of black South African children under age five lived in a household with adult(s) eligible for pension. Using weight-for-height and height-for-age as anthropometric indicators of child nutrition, the impact on child health of children living in households with member(s) eligible for pension is studied. The estimates suggest that pensions received by women significantly impacted the anthropometric status of girls but had little effect on that of boys. No similar effect was found when the pension recipient was male. In conclusion, it is suggested that public transfer efficiency programs may depend on the gender of the recipient. In critique, the improvement in child health is not likely to be the objective of an old age pension scheme. However, the study may still have relevant implications for public policy design, namely: should the objective of a policy be to transfer resources to children to improve child nutrition and health, it may be preferable that the state transfers target women rather than men. Although the evidence from this study cannot be generalized to other (developing) countries and, of course, would be hard to replicate due to the scope of the old-age pension program expansion in post-apartheid South Africa, it suggests that the impact of a public transfer program may vary depending on how it is administered. Moreover, even though this study focuses on the impact on child nutrition, it would also be interesting to study other investments in child human capital such as education. For example, maybe pensions received by men have a higher propensity to affect grandchildren’s education level?